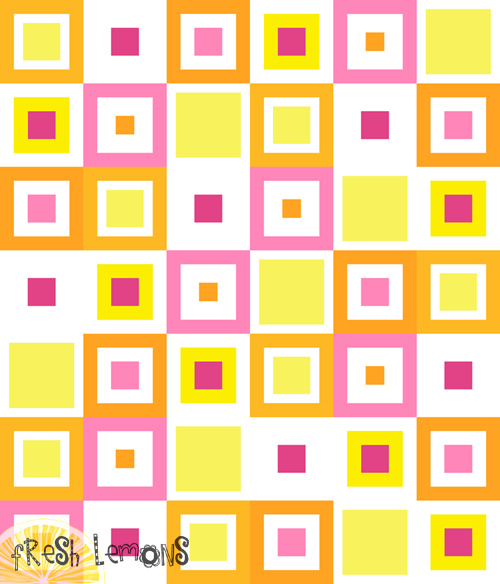 The Lemon Squares Quilt Pattern is a squares-in-squares quilt that is made out of only 6 types of blocks. See the blog post about this finished quilt here. I chose to make this quilt look scrappy by using a wide variety of fabric from my stash. You could also use solids and have a classic, cleaner look. I used 5 sets of fabric colors for my quilt and that is reflected in the mockup: Light pink, dark pink, light orange, dark orange, and yellow. 1. Cut out the fabric for your squares. 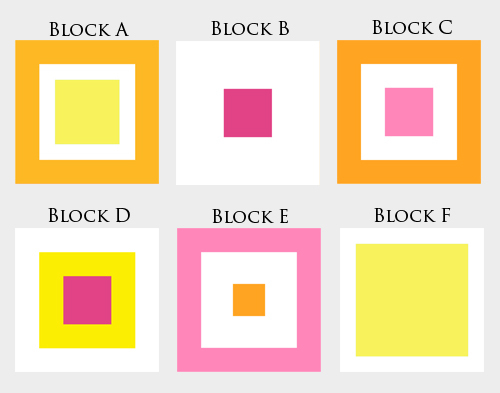 Below are the piece sizes for each of the 6 types of blocks. My quilt consisted of 7 rows. Each row had one of each of the 6 types of blocks. So, if you wanted to create a quilt of the same size and look, you would need to cut out 7 of each of these blocks. ******************************************************************************** Update: I receive a lot of emails asking if so-and-so is enough fabric for this quilt. I made my quilt from scraps, so I never had made cutting diagrams. I have updated this pattern to include a pdf of suggested fabric amounts/cuts. 2. Sew squares together using a 1/4" seam allowance. This should leave you with an approximate 10" square. 3. Square your blocks to 9.5". 4. 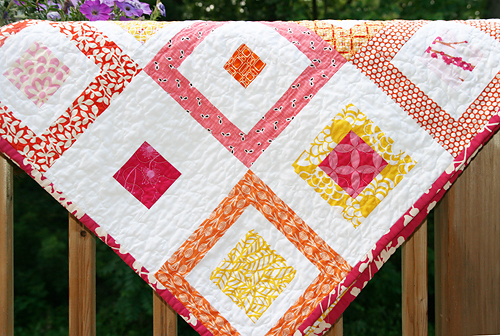 Arrange your blocks randomly for the finished quilt and sew together. 5. Create your backing, baste, quilt and bind! Enjoy your fresh Lemon Squares! I hope you enjoy the pattern and I'd love to see what you make!